I am not often drawn to comment on editorials, but a piece by Nicholas Kristof in this Sunday's New York Times seemed worthy of note. In the piece, "The Big (Military) Taboo," Kristof attempts to make the argument that as the United States faces difficult budgetary decisions the military should come under serious fiscal scrutiny. While there is no doubt that such an investigation could result in significant savings, Kristof motivates his argument by citing several statistics related to the size of the U.S. military; with the assertion that they represent evidence of waste. The trouble with these figures is they are absolute numbers, which are inappropriate in the context of this argument. The United States spends nearly as much on military power as every other country in the world combined, according to the Stockholm International Peace Research Institute. It says that we spend more than six times as much as the country with the next highest budget, China. The statement is true, but deceiving. While the United States does spend more than nearly every other country combined, our collective wealth is equally disproportionate . 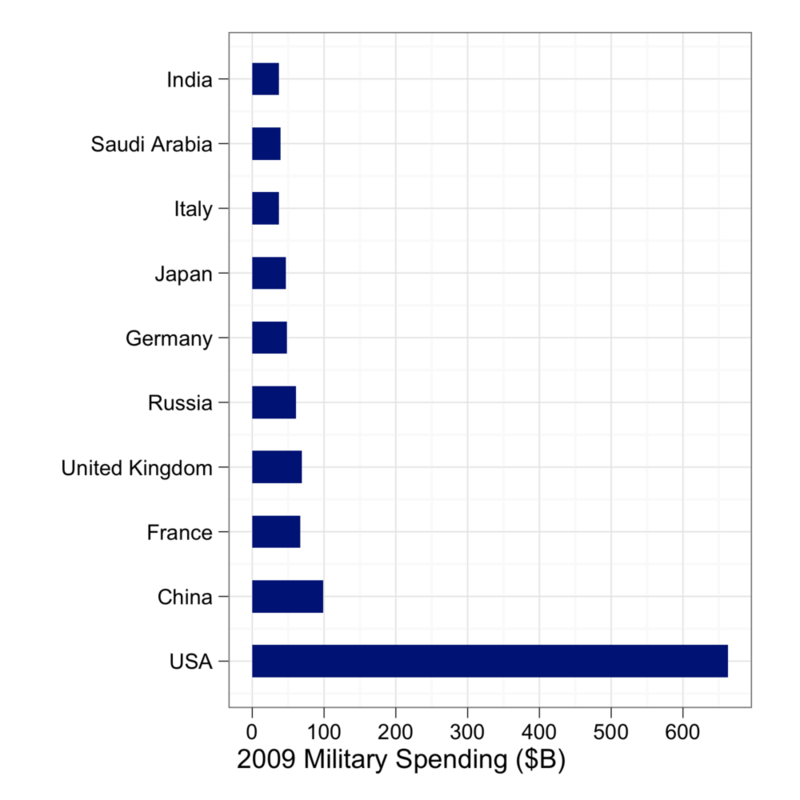 The better comparison is to show how much each country spends on their military as a percent of GDP. This provides a more common reference among countries. As you can see, in this perspective the United States is not nearly as notable an outlier. The intelligence community is so vast that more people have “top secret” clearance than live in Washington, D.C. The estimated population of Washington, DC as of July, 2009 is 599,657. First, that's not a very big number relative the total population of the U.S., or other small states (my home state of Connecticut boasts a population of over 3.5 million). Furthermore, the number of individuals with "top secret" clearances is unknown, but the Washington Post estimated the number at 854,000. On its own that seems large—nearly one million. Consider, however, that number in the context of size of the U.S. population, which was recently estimated by the Census Bureau 308,745,538. If these estimates are accurate then approximately 1-in-361 Americans holds a "top secret" clearance, or about 0.2% of the population. For those in the New York City area, those proportions would equate to about 22,151 fellow New Yorkers, a slightly more than one-quarter filled New Meadowlands Stadium. Certainly not a staggering figure by any means. Kristof also cites two other statistics. The first is that the U.S. maintains "more than 560 bases and other sites around the world." While a quick search did not yield any results, a more interesting metric would be growth in foreign bases, rather than total number. While the wars in Iraq and Afghanistan have expanded the U.S. military's established reach, it would be useful to see this in the context of global growth. His final point is that these contemporary wars will cost the U.S. more than the Revolutionary War, the War of 1812, the Mexican-American War, the Civil War and the Spanish-American War combined, even adjusted for inflation. Again, the better comparison is as a percent of historic GDP. Has the U.S.'s spending on wars increased as a percent of GDP since these wars, or decreased? It seems that the later would be true, but a more extensive data collection effort is needed to confirm.